 11  /’ NEW ‘10 Toyota prius $ 36 months, 15 cents per mile over 12,000 miles per year. Sale price of $17,242. First payment of $209. Security deposit of $0, cash or trade down of $0. Total to start $0. Residual of $9,873 $650 Acquisition fee. Excludes taxes, title, documentation and license fees. With approved credit. 209*/mo. 2.9% 36 months, 15 cents per mile over 12,000 miles per year. Sale price of $21,757. First payment of $239. Security deposit of $0, cash or trade down of $0. Total to start $0. Residual of $13,827 $650 Acquisition fee. Excludes taxes, title, documentation and license fees. With approved credit. 239*/mo. $ 36 months, 15 cents per mile over 12,000 miles per year. Sale price of $23,625. First payment of $259. Security deposit of $0, cash or trade down of $0. Total to start $0. Residual of $14,592 $650 Acquisition fee. Excludes taxes, title, documentation and license fees. With approved credit. 259*/mo. 2.9% APR for 60 Month Financing - ALL TOYOTA CERTIFIED VEHICLES ‘07 Toyota Sequoia LTD 4x4 #HIL225A. Leather, sunroof, quad seats. A.P.R. for 60 mo. ‘06 Toyota Sienna LE #SEN256A. Power sliding door, local trade, power equipment. A.P.R. for 60 mo. ‘07 TOYOTA FJ CRUISER 4x4 #10102P. 4.0 auto, 38k miles, loaded. ‘08 Toyota highlander ltd awd #H1L322A. 35K miles, sunroof, leather. ‘08 Toyota Camry XLE #10063P. Leather, heated seats, sunroof. A.P.R. for 60 mo. 2.9% 2.9% $ 32,990 2.9% 17 ,990 $ 24,990 $ 31,995 2.9% $ 18,990 ‘09 Toyota Matrix #10088P. Power equipment, 30K miles. A.P.R. for 60 mo. 2.9% ‘08 Toyota Camry XLE #RAV152A. V6, leather, sunroof, 13K miles. A.P.R. for 60 mo. 2.9 for A.P.R. for 60 mo. % ‘08 Toyota ‘09 Toyota sequoia sr5 4wd Highlander LTD AWD #10097P. 3rd seat, power equipment, like new. #10094P. 1 owner, local trade, 3rd seat, power equipment. A.P.R. for 60 mo. 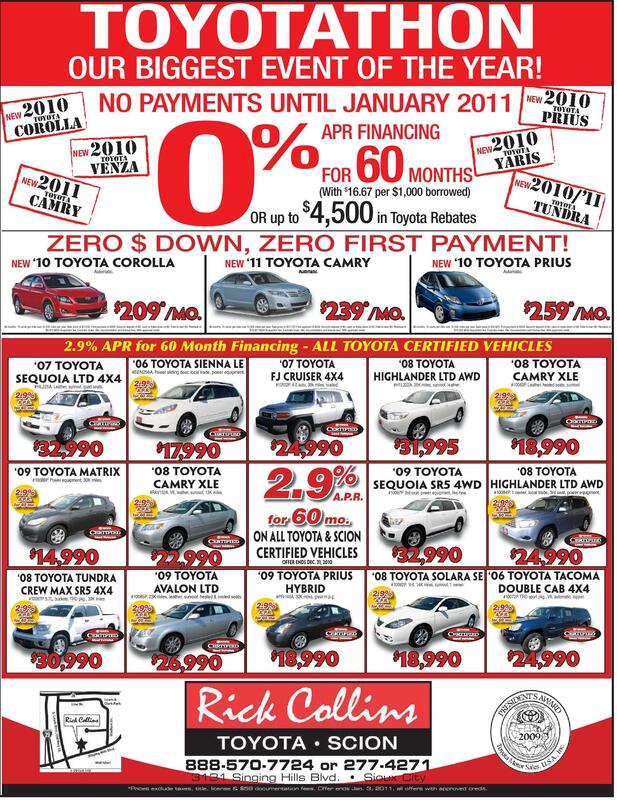 $ 14,990 2.9% $ 22,990 ON All TOYOTA & Scion CERTIFIED VEHICLES Offer Ends Dec. 31, 2010 60 mo. A.P.R. $ 32,990 $ 24,990 ‘08 Toyota Tundra Crew Max SR5 4x4 #10087P. 5.7L, buckets, TRD pkg., 39K miles A.P.R. for 60 mo. ‘09 Toyota Avalon LTD #10085P. 23K miles, leather, sunroof, heated & cooled seats. A.P.R. for 60 mo. ‘09 Toyota Prius Hybrid #PRI140A. 32K miles, great m.p.g. 2.9% 2.9% A.P.R. for 60 mo. ‘08 toyota solara se ‘06 Toyota Tacoma #10082P. V-6, 14K miles, sunroof, 1 owner. Double Cab 4x4 2.9% #10072P. TRD sport pkg., V6, automatic, topper. A.P.R. for 60 mo. 2.9% $ 30,990 $ 26,990 $ 18,990 $ 18,990 $ 24,990 888-570-7724 or 277-4271 *Prices exclude taxes, title, license & $59 documentation fees. Offer ends Jan. 3, 2011, all offers with approved credit.